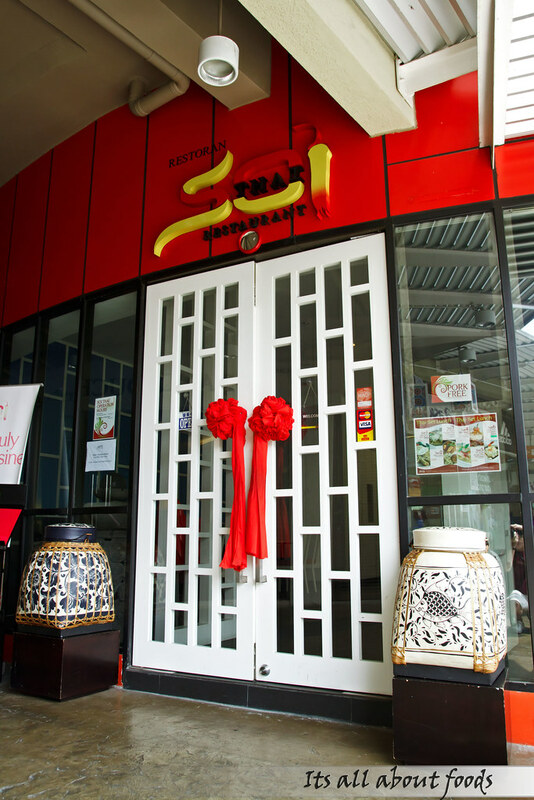 Located in the lush green and beautiful vicinity of Desa Park City, Soi Thai Restaurant is a relatively new food and beverage scene in Kuala Lumpur. 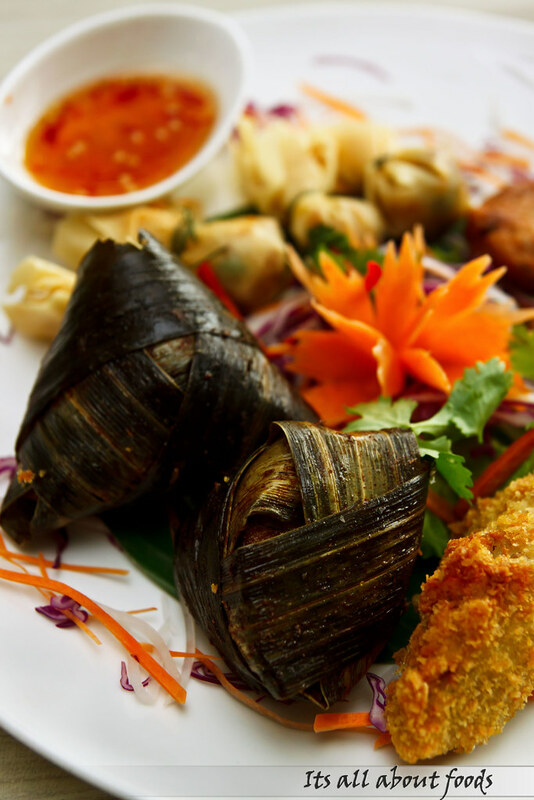 This restaurant belongs to the member of Pulai Group, serving exotic Thai delicacies with warm hospitality of Thai customs. We feel glad to be invited for a lunch at Soi Thai one Saturday afternoon. Pushing through the door with Oriental elements, Soi Thai welcomes us with modern contemporary interior, simple yet elegantly furnished. 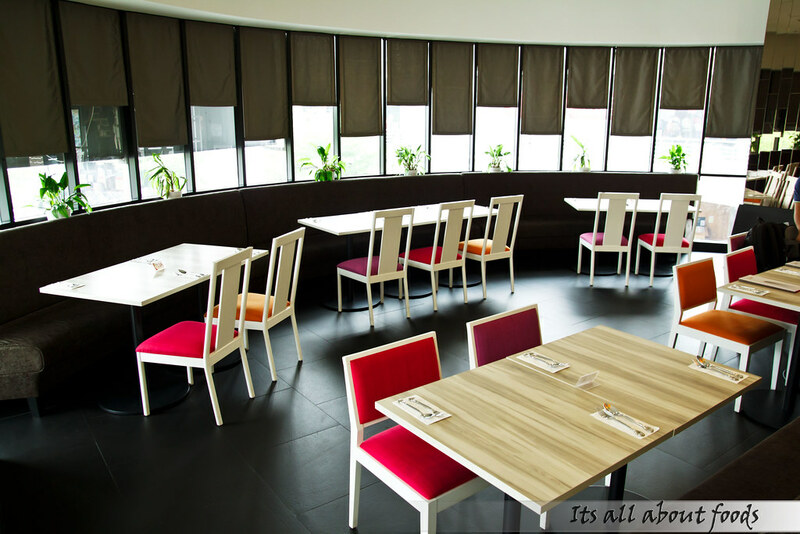 The entire restaurant is spacious, brightly lit and welcoming. 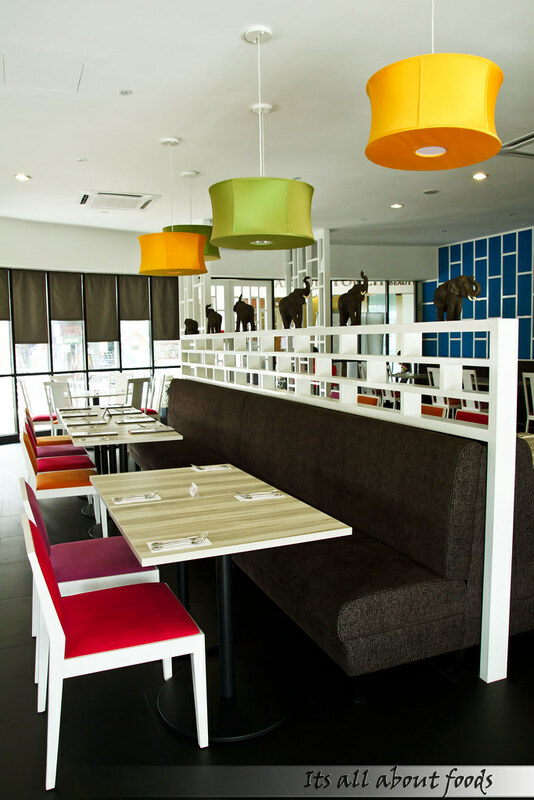 Furniture settings are funky and colourful, bringing a cheerful dining mood once seated down. Though modern interior is highlights, the Thai nation symbol- Thai elephants are not forgotten, as array of Thai elephants are seen lining up on the shelf. 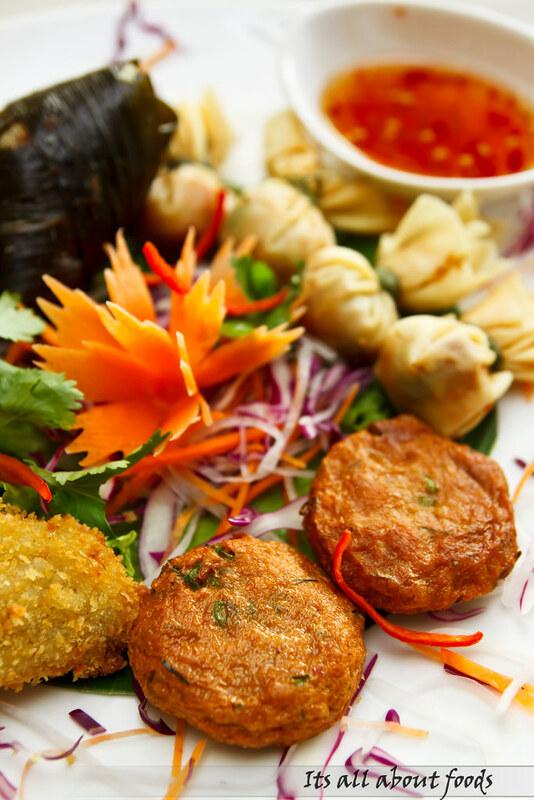 Flipping through the beverage menu, Thai speciality drinks are not to be missed. 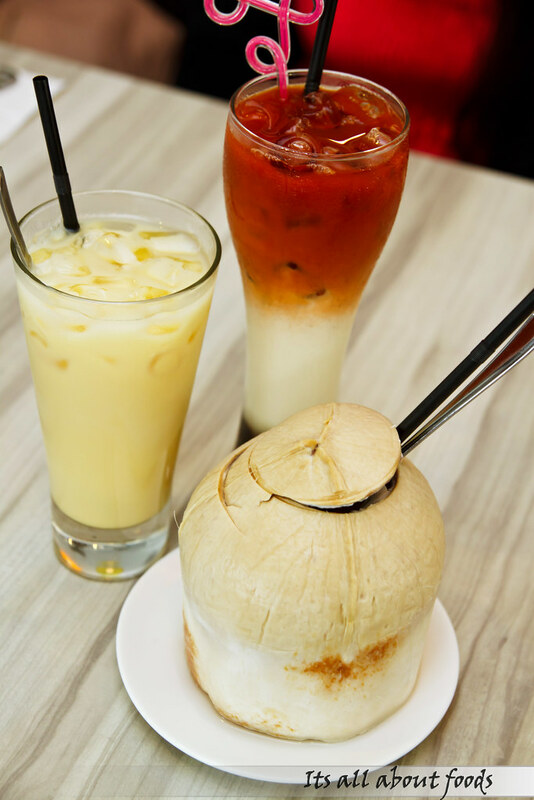 Thai Coconut (RM6.50), Thai Iced Tea (RM7.00) and Soi Thai Punch (RM7.00), all so chilling and thirst quenching over the hot afternoon. 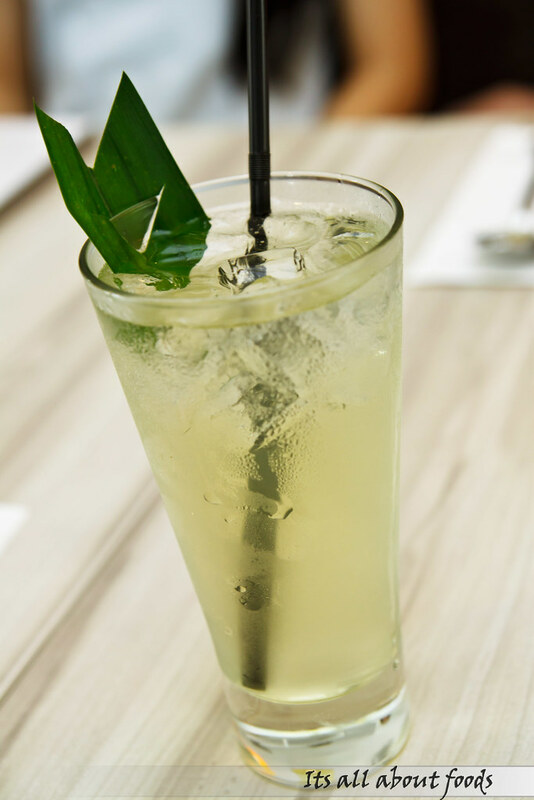 Decoction of pandan leaves that results in very barley like taste, a drink that cools the body and calm your nerves, especially good for women. 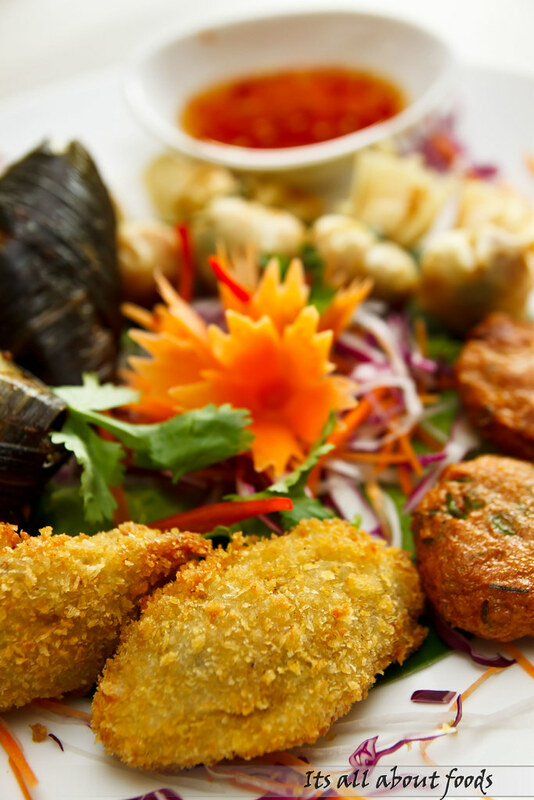 We start off the meal with Soi Thai Appetizer, a combo that gathers every Thai signature appetizer in one plate- Deep Fried Fish Cake, Crispy Money Bags, Pandan Leaves Chicken and Deep Fried Chicken & Crab Meat. Thai Money Bags and Deep Fried Chicken & Crab Meat are freshly hot, crispy and brimming with moist fillings, very hard for not to like. 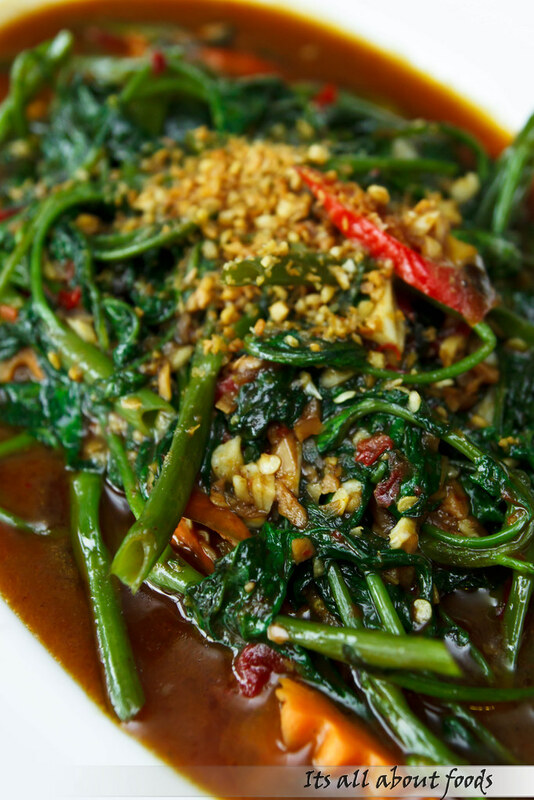 Pandan Leave Chicken is our favourite among all four as it is really tender and flavourful. 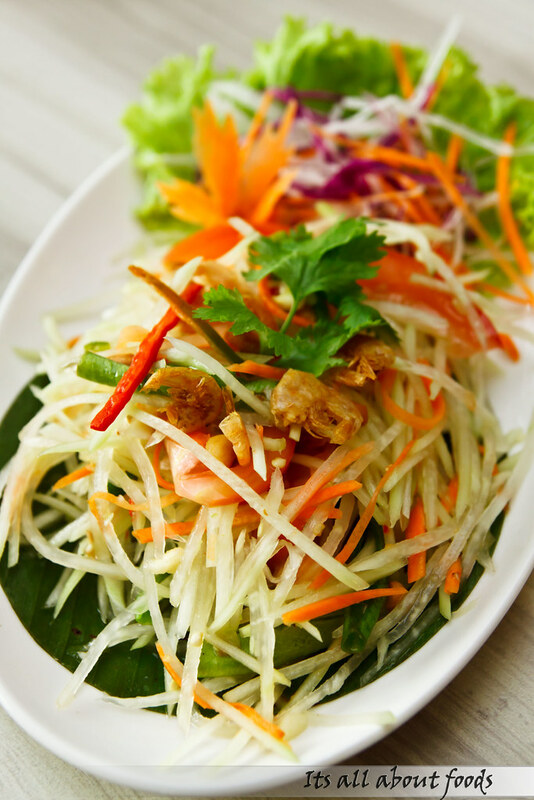 Shredded young papaya, carrots, chilli and crushed peanuts tossed in tangy sauce, bringing a crunchy, tangy and rich texture that serves as a lovely entree that opens up your appetites. 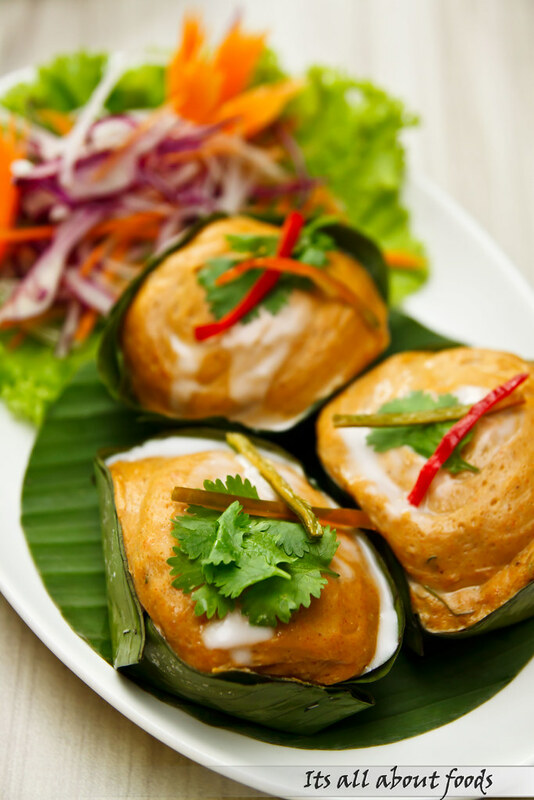 Nestled in pandan leaves container, the Thai Style Otak-otak tastes unexpectedly good with a creamy and jelly soft texture. Also, garnished with dollops of coconut milk to enhance the flavour. 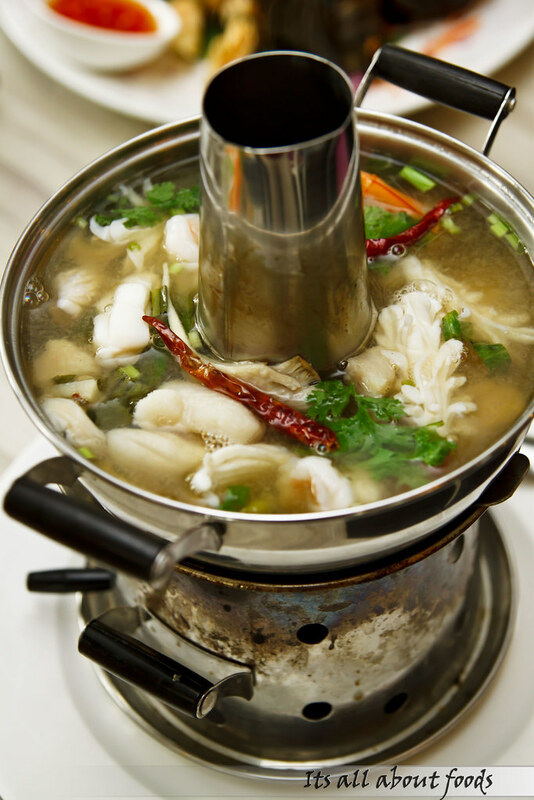 It is mild in spiciness, so no worries as it will not burn your tongue. Next on is the steamed siakap in a bed of soup-like gravy. 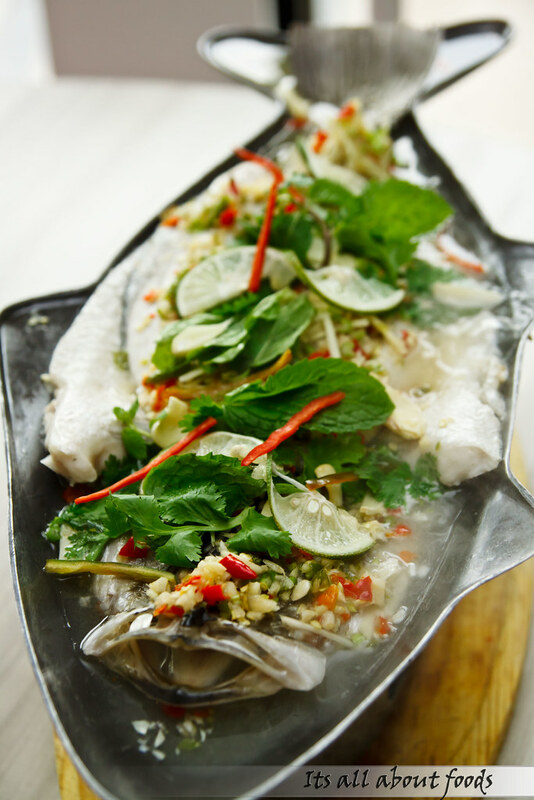 The lime and chilli combines a tangy, sourish and spicy concoction that flavours up the fish heavenly. Be careful not to bite into the chilli paddy as it might make your tears drop. 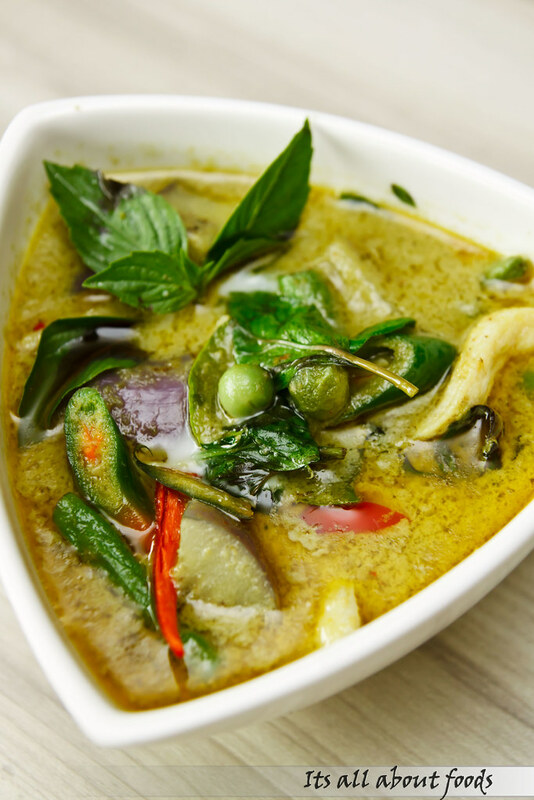 The Thai Green Curry has thickly cut assorted vegetables and tender boneless, skinless chicken chunks swimming in thick and coconuty creamy green curry. Not too fiery yet a spicy comforter that we never fails to like. 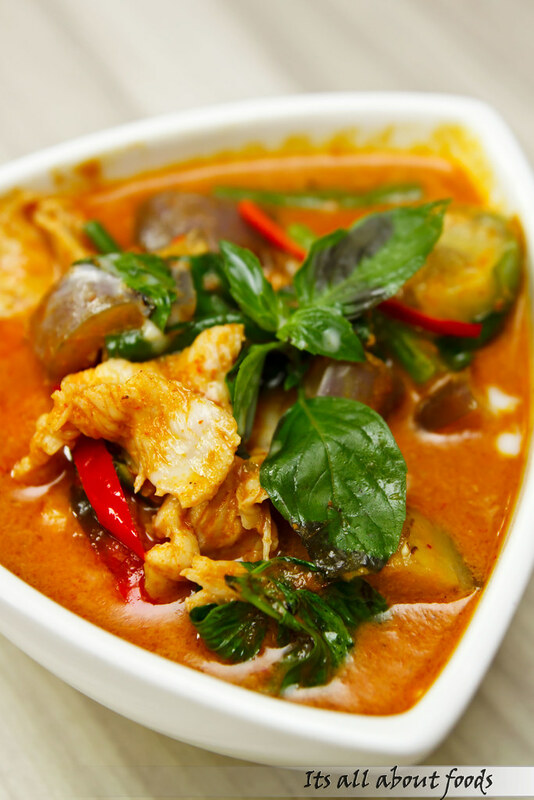 Continue the spicy gastronomic journey with Thai Red Curry, featuring red hot gravy swamped with ingredients like brinjals, fish, long beans, etc..
A subtle blend of hot, spicy, salty and sourish flavours with fresh seafood like squid, prawns, and fish, tingling the taste buds and makes you order another bowl of rice. 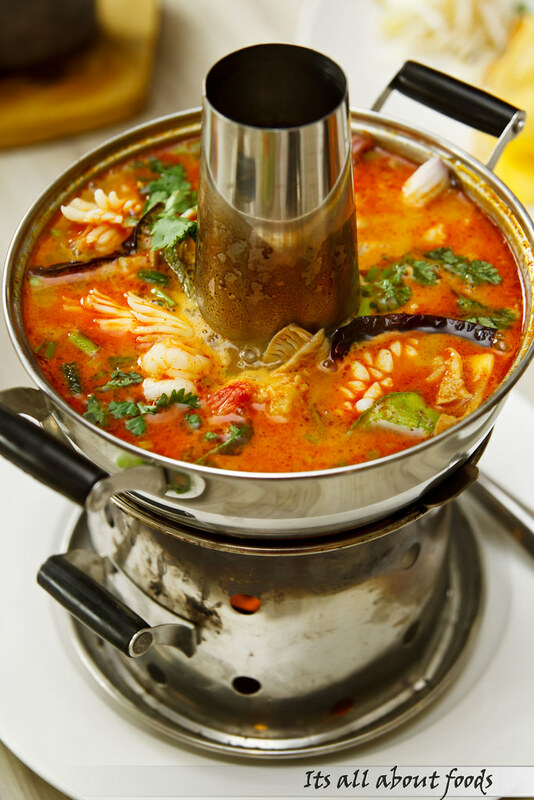 Comparing to the red hot tom yam, the girl likes the clear tomyam soup more for it is less oily but never lackluster in taste. Good to savour while is hot because the sourish taste turns distinct when cold. 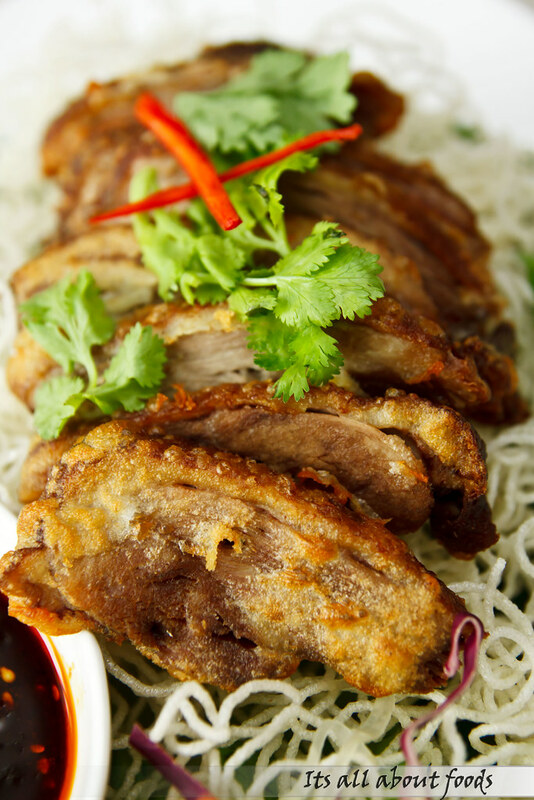 Slices of roasted duck, thinly battered and deep fried until golden brown. Very crispy and addictive, so good that we can hardly call it enough and we wish we could have two more servings. 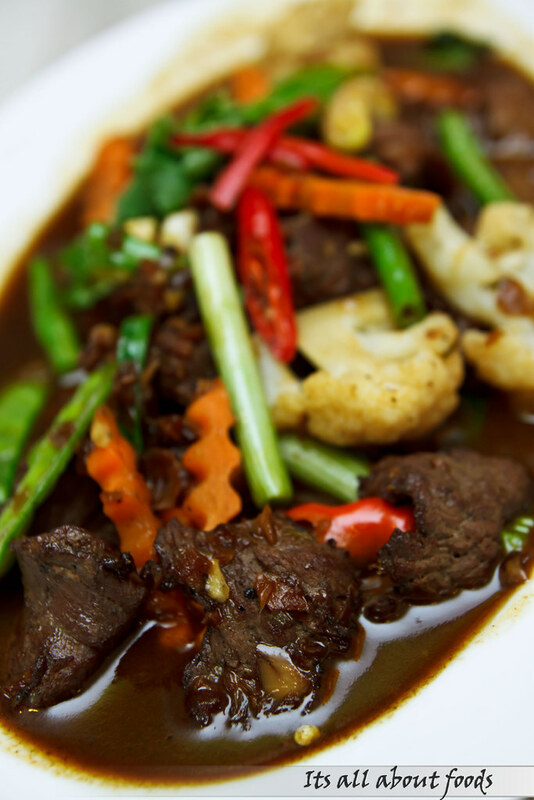 A favourite dish among Thai, where tender and flavoursome beef slices are stir fried with ginger, spring onions, saute with thick oyster sauce that is enough to kick up the flavour. Very similar to our Chinese Dai Chao stir fried kang kung, packed with fragrance flavour of belacan but too oily and salty for my liking. 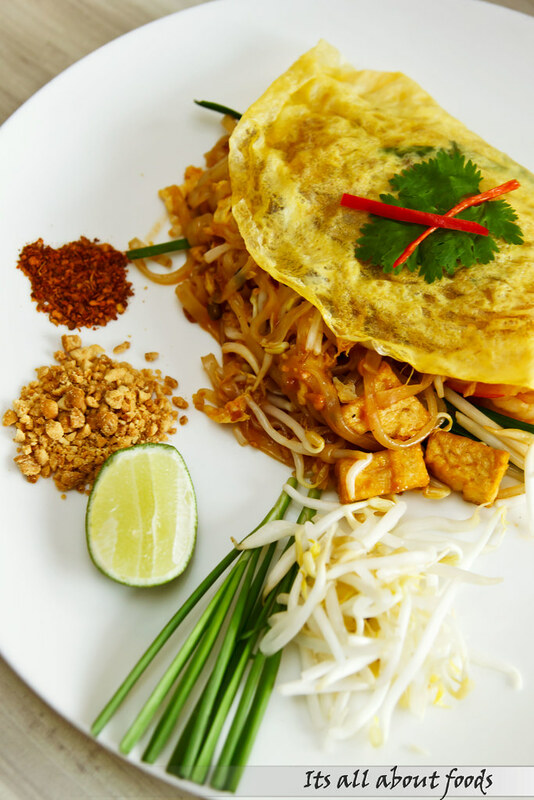 For those who wish to have individual meal instead of ala-carte dishes, Phad Thai is one of the good choices. Soft and chewy with a hint of spiciness but on the sweeter side, the noodles tastes satisfyingly good. 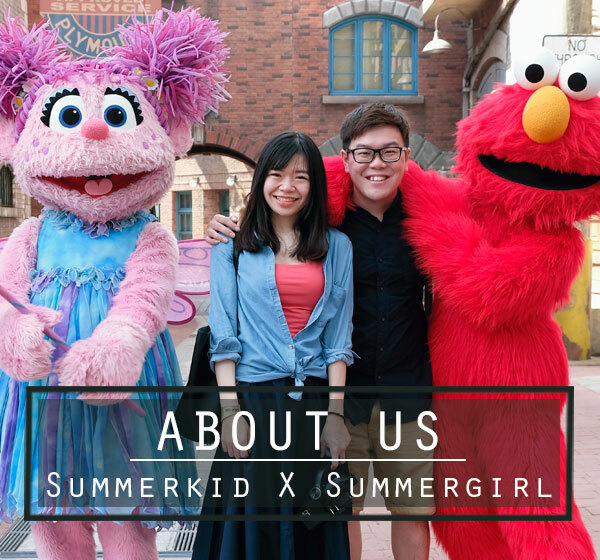 Other than Phad Thai, there are a variety of single bowl such as Thai Noodle in Duck Soup, Stir Fried Glass Noodles with Seafood, Baked Prawns with Glass Noodle, Thai Noodle in Duck Soup and Dry Thai Noodle with Roasted Duck, all seems tempting by just looking at the name. 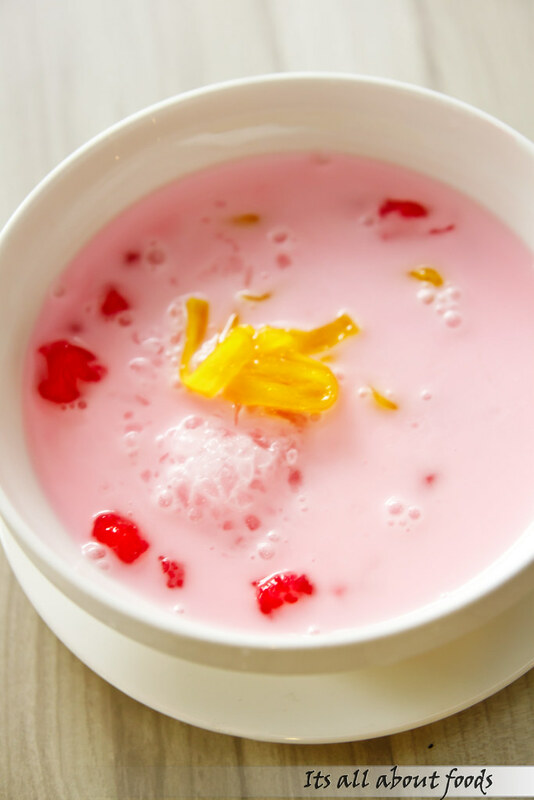 After an array of savoury dishes, we complete the meal by indulging in some Thai favorite desserts such as Water Chestnut and Jackfruit in Coconut milk ( Thab Tim Krob). Sweet and chilling, better if with thicker consistency. Other than the usual Tim Tab Krob, we tried out something different- Sweet Pumpkin in Coconut Milk. With velvety coconut milk as finishing touch, the sweetened pumpkin drenched within is creamier, earthier and smoother. Beautiful warm dessert. Steamed sweet delicacy that we mistakenly thought as steamed yellow sticky glutinous rice. 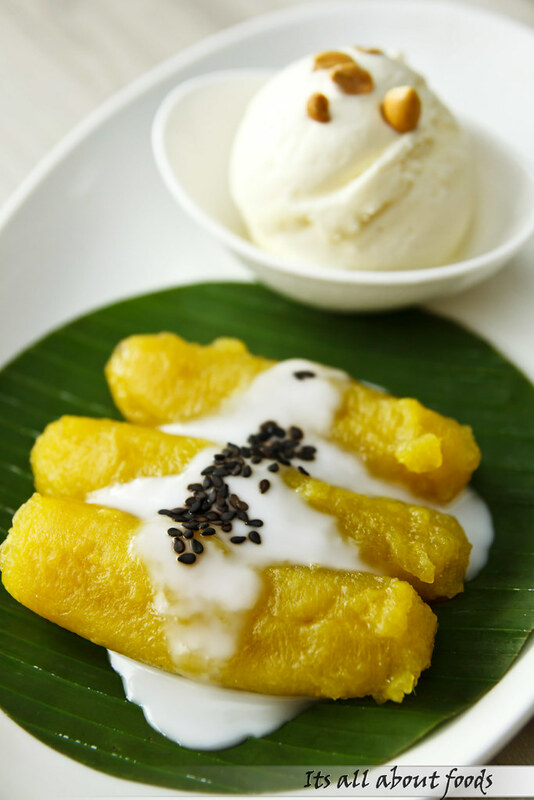 It is actually ripen banana that is mashed and steamed until soft, lacing with savory coconut milk and sweet vanilla ice cream. A meeting of sweet, savory, cold and hot that turn out well. 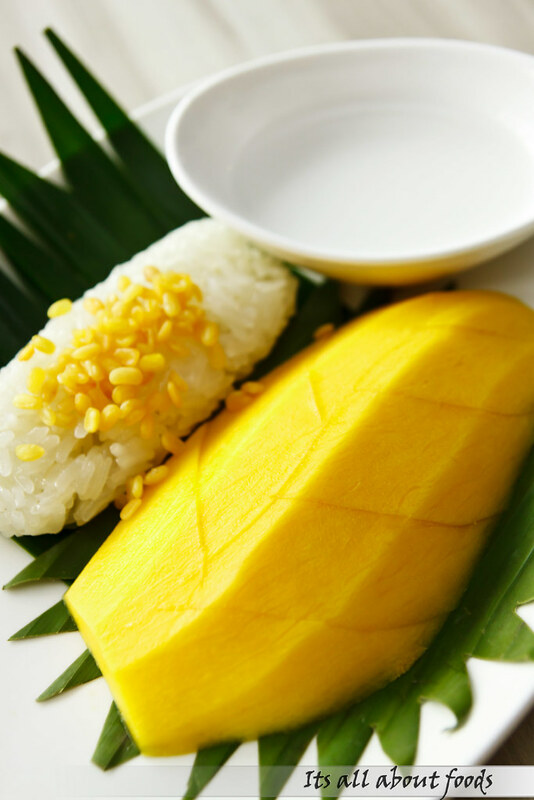 Mango sticky rice is equally good, but less surprise comparing to steamed banana with vanilla ice cream and sweetened pumpkin in coconut milk. 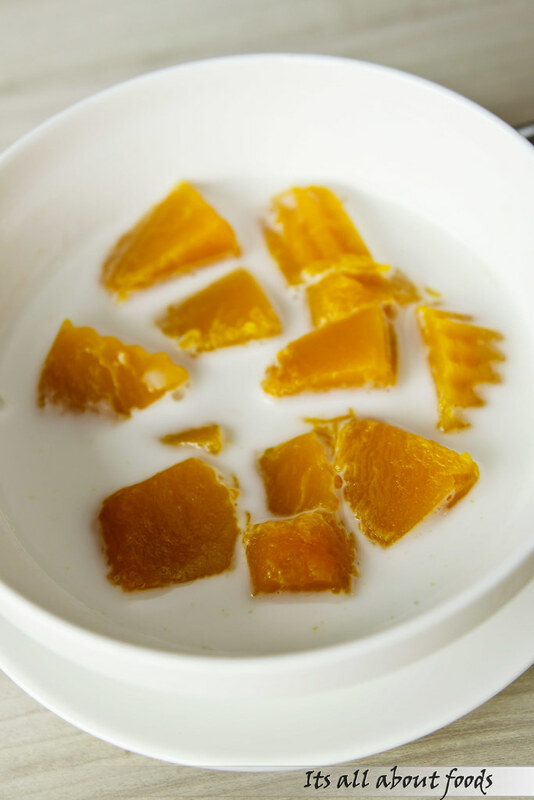 Lastly, we are treated with Coconut and Lemongrass Jelly with Sweet Mango. 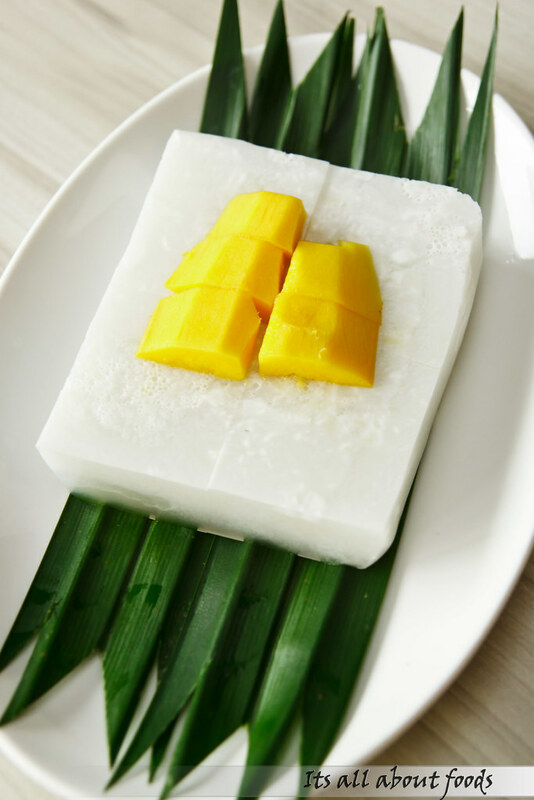 Light, bouncy in texture and less sweetened in taste, we guess this is the only dessert which is less cloying among all coconut infused desserts.